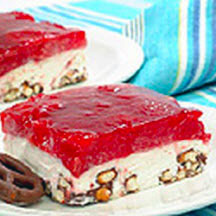 CooksRecipes has quality, kitchen-tested recipes for gelatin salads, from glistening molds to festive layered gelatin salads, that you can count on for successful deliciousness. 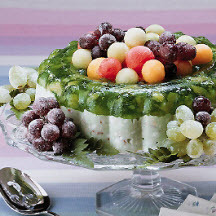 This festive salad has it all — good taste and presentation, perfect for the holidays and special occasions. Dessert or salad? This cool, refreshing dish has a decidedly dual personality and is so good ysou'll want it both ways! The name describes this salad perfectly — yum, yum! 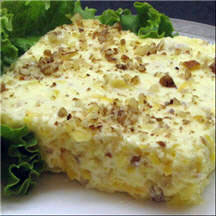 A creamy lemon gelatin salad with crushed pineapple, chopped nuts and shredded cheddar cheese.